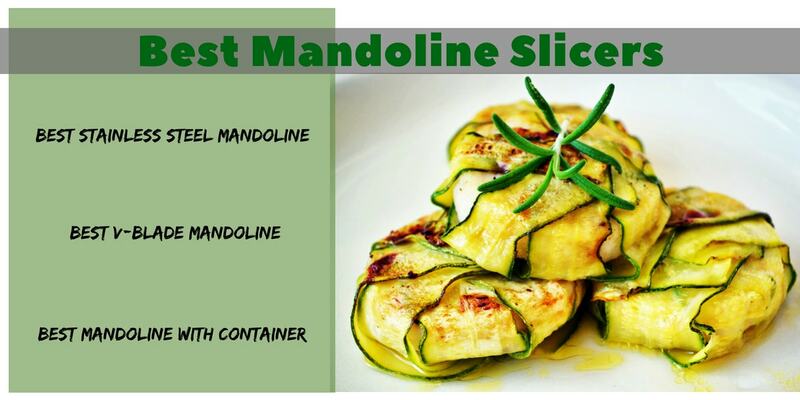 Once you get your first mandoline slicer, you’ll wonder why you waited so long! These kitchen gadgets are great if you get the right one. They’re not expensive. But even the cheapest product is a waste of money if you don’t get what you need. Take a look at these reviews to find the best mandoline slicer for your kitchen. This is a high quality mandoline made from stainless steel. The blades are very sharp but you get safety features included on this slicer. The blades are built-in. This is handy because you don’t need to be storing the blades separately which takes up extra space in your kitchen and can be a risk to kids or pets. Personally, I prefer a mandoline cutter with the blades built-in because I find it safer not to handle removable blades. Does this mandoline come with safety features? One of the reasons this is the best mandoline slicer in stainless steel is because it comes with extra safety features. Included you get a food-holder, blade safety sleeve, a blade guard and cut-resistant gloves. You can use the blade safety sleeve when you’re storing the mandoline and this protects everyone from an otherwise exposed sharp blade. This upgraded model from Grocery Art uses a stronger and thicker blade. The stainless steel blade on this mandoline slicer doesn’t bend and doesn’t need sharpening. Is this mandoline dishwasher safe? Yes, this mandoline slicer is safe to use in the dishwasher. But you won’t need to. It is so easy to rinse off under the faucet. This is quick and easy and then you can use the space in your dishwasher for other items. I prefer to rinse a mandoline straight after using it. If you get into the habit of doing this every time there’s no need to have it taking up space in the dishwasher. Who is this the best mandoline slicer for? For the price, you get a high quality mandoline. CLICK HERE to see more details. Like most people, I own a food processor but I don’t use it as often as I could. The thought of having to clean it afterwards does put me off using it for weekday dinner preparation. The advantage of a mandoline vegetable cutter is that it takes up very little kitchen space and it is so easy to clean. If you live in an apartment or your kitchen space is limited then you’ll love owning a mandoline slicer. This stainless steel mandoline is best for people who want a high quality product to use frequently. Being sturdy, durable and easy to clean you get all the convenience you need. And it’s still an affordable product. If you’ve never used a mandoline before you’re going to love the time it saves you in the kitchen. How do the built-in blades work? Most mandoline slicers I’ve used in the past have removable blades. This offered choice in functionality but storing blades was never convenient. The built-in blades on the Grocery Art Mandoline cut slices from 1mm to 9mm or julienne slices from 4.5mm to 9mm. This is the best mandoline slicer for slicing but it doesn’t shred vegetables. If you want to use it for shredding you can make paper-thin slices of vegetables that are close to shredding but slightly bigger. To change the blades you simply turn the dial. Is this mandoline slicer easy to store? The mandoline slicer has feet which keep it in place when you’re using it. This is an advantage. This mandoline has a solid feel to it when you’re using it and yet it folds flat for storing, making it ideal to lay in a drawer. This is great for an RV where space is limited. I simply like to save space in my kitchen! This is the best mandoline slicer for anyone who is looking for a high quality product. You can use it regularly and the stainless steel is durable. Being easy to clean and easy to store makes it perfect for any kitchen – even for use in an RV or a tiny apartment kitchen. You’ll be pleased you bought this mandoline. This Mueller Austria V-Pro Mandoline is slightly different to the above mandoline cutter in that it has V-blades instead of the straight across type. This mandoline slicer comes with 5 surgical stainless steel blades. They’re very sharp so you need to be careful. You also get a food-holder which you should always use to protect your fingers. This mandoline slicer allows you to slice, julienne and shred/grate. One of the blades also allows you to do a crinkle cut slice which is an advantage over many other mandolines. The cutting thickness can be adjusted for each blade by turning a knob on the mandoline cutter. This gives you plenty of control over the thickness you want for each vegetable. Why is this the best mandoline slicer with removable blades? Personally, I prefer to not have to store blades but with the Mueller V-Pro Mandoline Slicer it comes with a storage box to fit all 5 blades when you’re not using it. This is a smart idea and makes it much easier and safer to store the blades when not in use. The julienne function is built in to the mandoline. You turn a dial to bring the julienne blades up when you want to use them. What is the mandoline made from? The body of the slicer is made from BPA-free durable reinforced ABS plastic. Is this mandoline slicer sturdy? If you need to buy cut-resistant gloves, these are some of the best – CLICK HERE to see more details. They can be used for lots of different cutting jobs in the kitchen – when using a mandoline, cutting with a knife, grating, carving, oyster shucking and more. This brand comes in 4 different sizes. This mandoline comes with feet at each end to stand it up on your counter. Personally, I prefer a mandoline with feet rather than handheld. If you’re using a handheld mandoline you need to put it down and pick it up by the handle every time you go and wash a vegetable to go to the fridge for more ingredients. The feet are rubber silicone covered so they stay in place on counter tops. This mandoline has a sturdy feel to it when using. I prefer to have a mandoline on feet that is ready to go the entire job. So even if I go to the fridge to get more vegetables I don’t need to be standing it up again by the handle every time. And I find it easier to use a mandoline slicer without having to hold it up with one hand. You only pay a few dollars more (about $5-$9 more) to get a mandoline with feet so I’d say choose this option if you can. It offers a lot more convenience. The Mueller V-Pro allows you to place it on the counter, on a cutting board or on top of a bowl. The feet fold underneath for flat storage. This is the best mandoline slicer if you need to shred cheese or vegetables as well as slice. The different blades let you shred in addition to slices or julienne. This mandoline is a sturdy product. It is convenient to store flat and the included box for the blades is an advantage. It offers more choice in cutting options with more variety and you can adjust the thickness easily by turning a knob. This is the best mandoline slicer for anyone wanting a solid-feel mandoline with a variety of blade choices. It is perfect for small kitchens and the storage box for the blades helps keep everyone safe. This is the best mandoline slicer with a container included. The HomeNative Mandoline offers the convenience of a container to catch the slices as they are cut. This is great for keeping everything neat and tidy on your counter. You can even use the container to store your slices in the fridge. It includes 5 different blades for slicing, grating and julienne. You can adjust the thickness to three different settings – 1mm, 3mm or 5mm. This brand of mandoline for sale on Amazon includes a cut-resistant glove (as listed in the description) making it safer to use. The blades are very sharp. The container has the advantage of a soft grip, non-slip base to keep in place on your counter while you’re slicing. A food-holder is included and should always be used for safety reasons. This mandoline is top-shelf dishwasher safe but you’ll probably just want to rinse it off under the faucet after use because it is so easy to do. At the time of writing this mandoline slicer has an average rating of 4.5 out of 5 stars for more than 380 reviews on Amazon. This is a very popular mandoline that customers are happy with. This mandoline can help you eat more vegetables by making it easy to slice them and easy to store them so you have them ready to cook or make a salad later in the day. The container comes with a lid to keep everything fresh. This offers great convenience with the catch container underneath the mandoline. It lets you avoid mess in your kitchen making clean-up easy. This is the best mandoline slicer for anyone who wants high quality sharp blades, variety of blades and the convenience of a storage container for the slices to go straight into the fridge with its own lid. ⇒ Do you like to make fries at home? The Philips AirFryer gives you a healthier option – Click Here to see more details. This entry was posted in Small Appliances on June 1, 2018 by Edwina.